This is a familiar scene all over the Lake Chapala region. 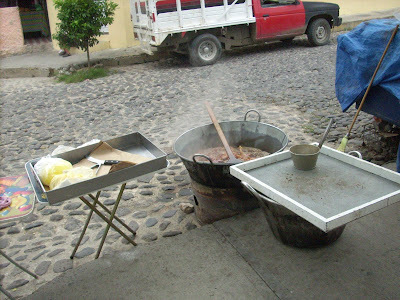 Here, just blocks from our house, a family has set up this tub and have started cooking pork to be sold as "carnitas" later in the day. This photograph was taken this morning as we walked to the town square for breakfast. Don't ask. It's pork -- cerdo -- and carnitas are one of life's little gastronomical pleasures.